The Watauga County Swim Complex is pleased to announce that our swimming pools operate by salt chlorine generation. Saline chlorination is a safer, more effective and environmentally friendly method for sanitizing swimming pools. The salt water feels smooth and silky on your skin while swimming. The salinity level of our pools is similar to eye drop solution or human tears; making your swimming experience even more enjoyable. 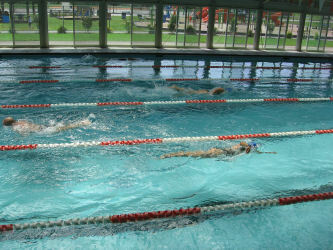 To begin, pure non-iodized table salt, or sodium chloride, is added directly into the swimming pools. As the saline pool water passes through the chlorine generating cell located in our pump room, electricity is applied to the metal plates inside the cell. Low voltage electricity is applied to the saline water. This in turn produces the chlorine used to kill the bacteria and algae. Once the chlorine generated from the salt has killed the bacteria and germs, it reverts back to salt, and the process begins all over again. No, salt is added to the water, but only in very low concentrations. Sea water has a saline concentration of approximately 35,000 ppm. Our system operates with a concentration of around 5,000 ppm., or about one seventh of the ocean. Mildly saline water is more pleasant for a bather than sea water. Salt chlorinators essentially turn the swimming pool into "mineral spa water", allowing users to enjoy the ultimate swimming experience available. 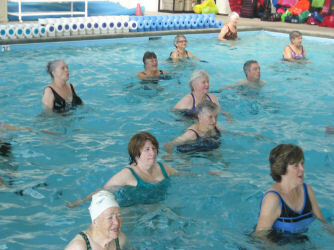 In addition to the salt system, we also offer distinct water temperatures in each pool for our diverse users. 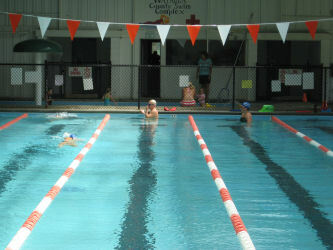 The Lap Pool is 80-81 degrees and the Training Pool and Kiddie Pool is 84 – 86 degrees.